Location: Pinto Basin Road, Joshua Tree National Park. 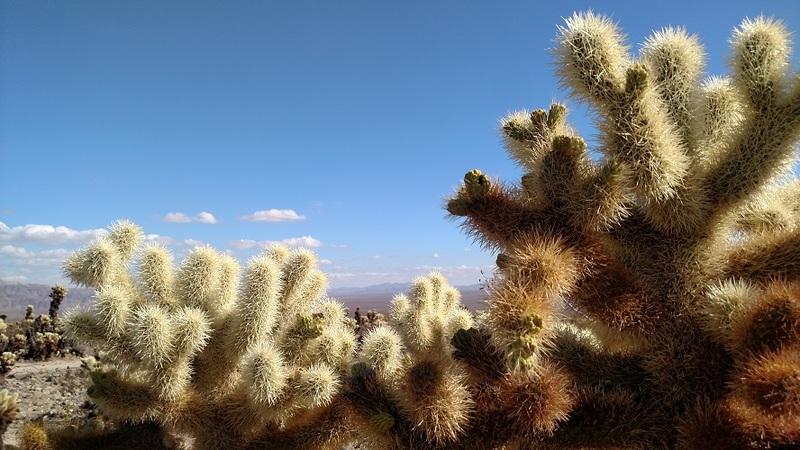 The Cholla Cactus Garden Trail is 18.4 miles southeast of Highway 62 (via Utah Trail, Park Blvd. and Pinto Basin Rd.) and 27 miles north of Interstate 10 (via Cottonwood Springs Rd. and Pinto Basin Rd.) Entrance to Joshua Tree National Park is $25 per vehicle (for one week). Annual passes are $40. The Interagency Pass ($80 annually) is also accepted here. Camping: Day use only. The nearest campground is White Tank, about four miles north on Pinto Basin Road. 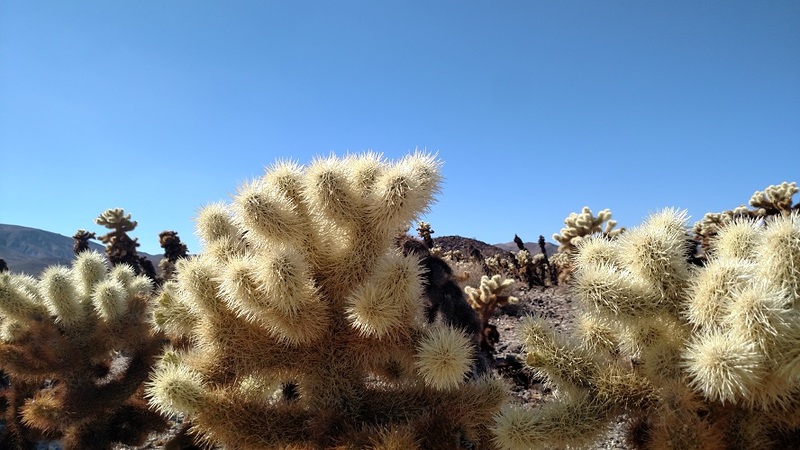 If you are driving from the north to south ends of Joshua Tree National Park on Pinto Basin Road, you will pass the Cholla Cactus Garden Trail. It makes for an ideal spot to stop and stretch your legs – but make sure your legs don’t get too close to the infamous plants, which are found in abundance here. 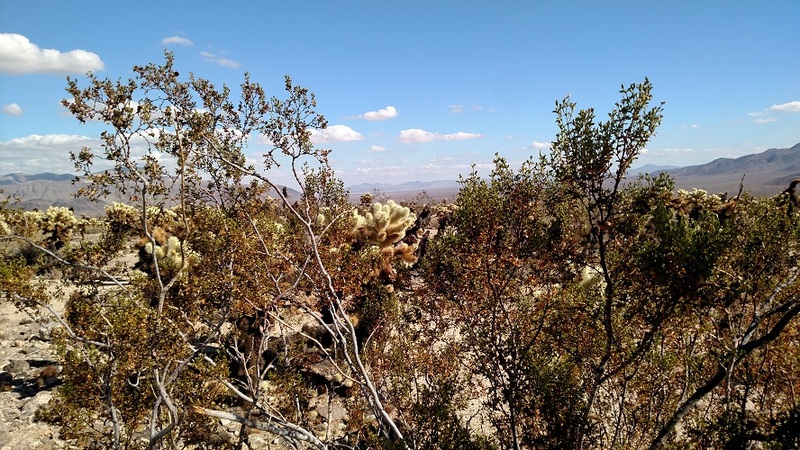 Cholla cacti are known for “jumping” on passersby. If you are reasonably careful, you will not have any problems avoiding them, but exercise extra caution if you are hiking with kids. The short trail takes visitors through an impressive collection of the plants – a few of which are nearly 10 feet tall. 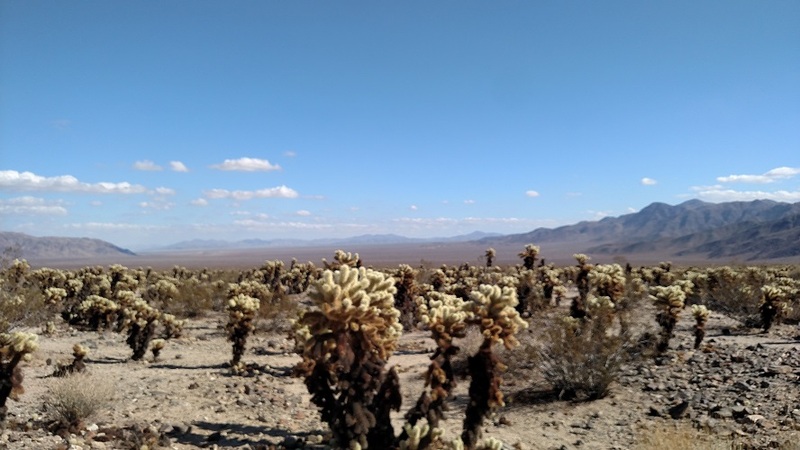 Besides the cacti another highlight of this trip is the panoramic view of the lower desert to the east. What incredible images!!! Thank you for posting these(and all the rest! ) you could publish all these posts as a book!! Thanks Ruth! The first 100 hikes posted on the site (back in 2010) have been (self) published in a book and I may do another one at some point.